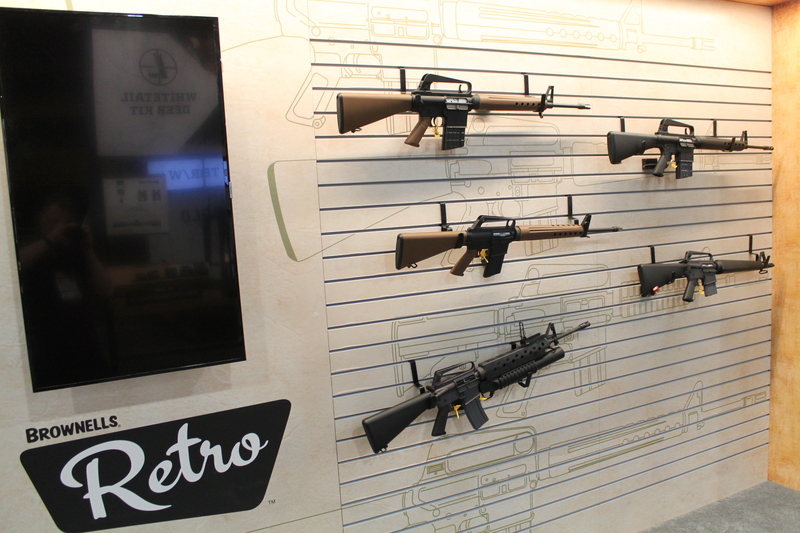 SIG SAUER have had an enormous booth at SHOT show the past few years, with a pretty mind boggling quantity and variety of products on show. All the way from their officially licensed airguns and airsoft line, through ammo, accessories, pistols and a smorgasbord of SMGs and rifles. The 2 weapons I wanted to checkout most were unfortunately behind glass during the indoor element of the show, but I took some pictures none-the-less. As a few of of you may know, I’ve spent the last couple of years pretty much exclusively working day-to-day on maintaining FN MAGs; that’s the L7/L112 GPMG, with the American equivalent being the M240. I’d say I’m pretty familiar with the workings and various nuances of the 2 versions of the gun used in my branch of service, I’ve done some firing with both and with the 240, though that’s purely on a short range; nothing operational or particularly challenging. With that in mind, to me personally any potential replacement or competitor to the MAG is very interesting as I like to see what sorts of features are employed. 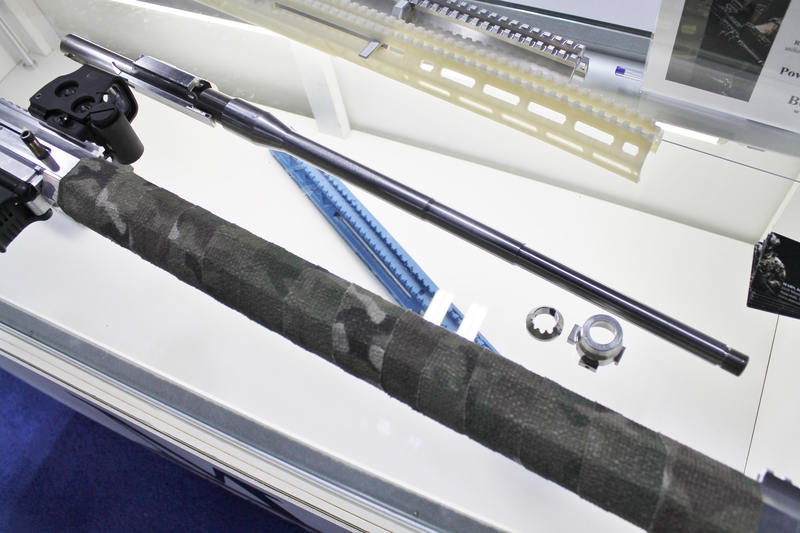 The MAG has seen widespread adoption and very extensive usage for many decades now with numerous countries around the world and it is well proven, but there is the potential for an upgrade out there now that technology has progressed. That said however, it is one of those designs that was so well done originally it has proven hard for manufacturers to come up with something that is sufficiently better in order to justify the cost of replacement. 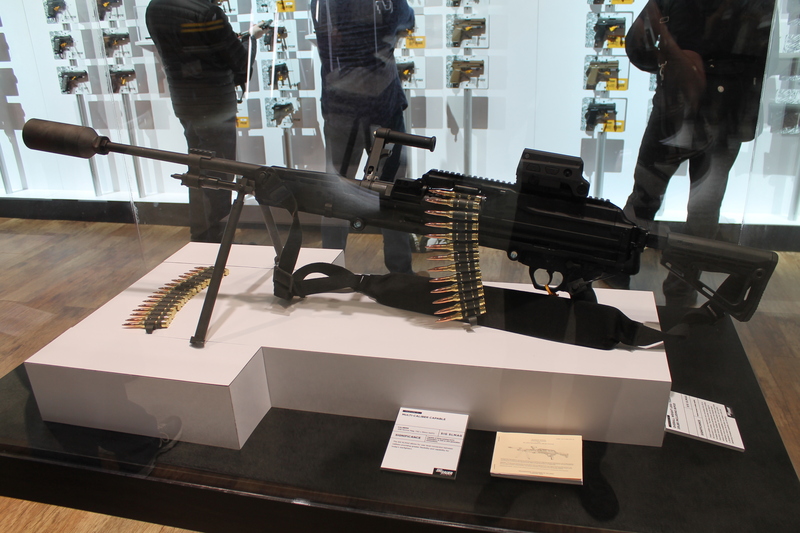 The Sig Light Machine Gun (SL-MAG) is aimed squarely at a new idea the US Army has for a belt-fed weapon chambered in .338 Norma Magnum that will potentially replace the 240 and give extended range with greater accuracy at range compared to 762×51. 762 NATO is certainly a potent cartridge, but it is quite long in the tooth and being an older design with a heavy bullet it has a more pronounced drop-off at range compared to the likes of 6.5 Creedmoor or .338NM. Piecing together what I’ve read online I believe armour penetration at range is another consideration the US Army has and that keys in to the potential M4/M16 replacement efforts that are going on which employ 6.Xmm projectiles, though that’s highly speculative on my part and I’ve no further information to hand at this time. Unlike the L7 that features altogether too many gas settings and the L112 and M240 that don’t have any at all, the SL MAG hits a middle ground with 3 settings. One is for suppressed use, with the other 2 presumably being normal and adverse for usage when heavily fouled. The SL also doesn’t have a buffer unit built in to the stock, so unlike the MAG the stock can be folded or just removed entirely in the field if so desired and the gun will still function without issue. 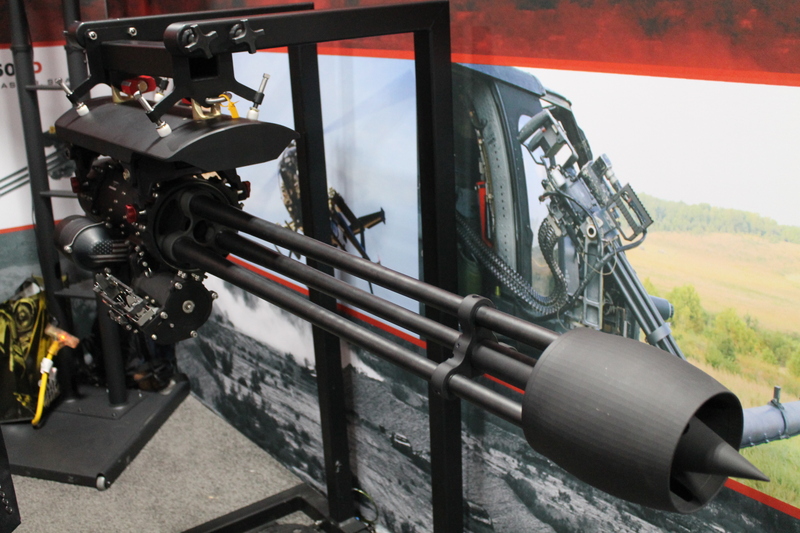 The inclusion of M-LOK is also a positive. 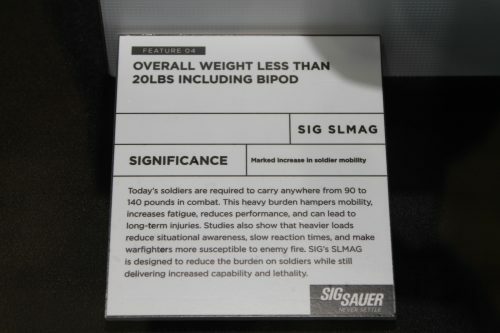 Whether the SL-MAG is military levels of reliable entirely remains to be seen and I’d imagine it will end up being tested by the US Army at some point if not already in order to determine that. I do have some concerns about it as a weapon for dismounted troops. 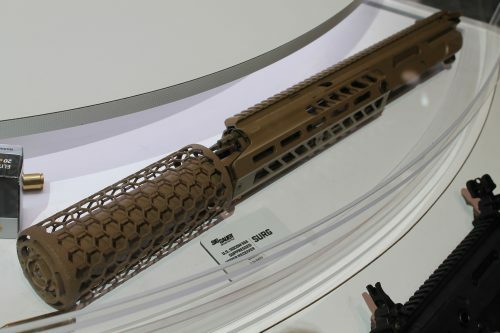 As you can see it does come in a few pounds lighter than the standard variants of the MAG which is of course a good thing, but then 338 ammo will weigh more than 308 so unless somebody, be it SIG or otherwise, comes out with some reliable plastic cased ammunition then all up weight for personnel might well end up being at least the same as before with potentially fewer rounds carried. It’s also not a slim gun at the rear end and bulk does play a factor for the guys who’re going to have to hump the thing in the most unpleasant conditions for days and days on end while also wearing armour and packs and all the other mess. I did consider bringing up the Knight’s Armament Company Light Assault Machine gun (LAMG) which, having briefly handled and fired it, does appear to be a truly amazing piece of engineering. It only weighs about as much an AR with a Block 2 type of extended quad rail and a couple of accessories, but you get a belt-fed MG with quick change barrels, barely any felt recoil, a nice, low and controllable rate of fire and all contained in a truly incredibly compact package. At the moment however the LAMG is only available in 762×51 at a maximum and I’ve no idea if it even could be scaled up to the calibre the US Army wants or if indeed KAC is interested in doing so. I’d really like to see some militaries take a serious look at it though to see how it performs under the rigorous conditions of military testing. From what I’ve read around it has passed the necessary tests and ticked the right boxes, although I’m not sure what stage of approval or acquisition it’s in right now and how long it might be before it potentially sees any significant issuing and usage.